Painted in 1883 by English painter Charles Burton Barber (1854-1894). Off to School is a wonderful example of the way the artist depicted the relationship between children and their pets. 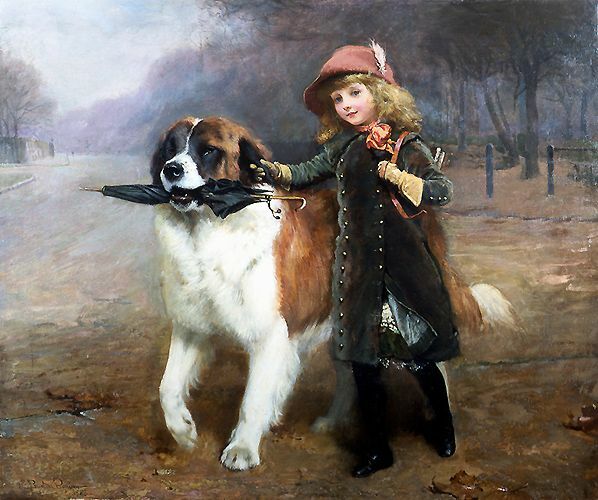 In this painting, we have a St. Bernard guiding his young mistress to school. She holds onto her book satchel and one of the dog’s ears. He is proudly carrying her umbrella as the two head off for school. The St. Bernard is almost the same height as the child. Barber catches the dog mid-stride, almost prancing. The inclusion of the umbrella and the displacement of the girl’s coat provide hints of inclement weather. The lace edging of her dress and the feather in her hat exemplify the level of detail Barber is known for. Off to School is a fine example of Barber’s skill at portraying the personality of the animals without adding humanistic features. You can just see the pride the dogs feels for escorting his mistress to school in his posture and carriage. There’s also a hint of fierceness in his eyes. He sends the message that he would protect the little girl with his life. And, yet, his gentleness shows by allowing the girl to hold onto his ear. Barber often depicted the feelings and expressions of both the children and the animals in his paintings. He was clearly an animal lover who could capture the soul of the animals without resorting to giving them human characteristics. He lived and worked during the Victorian era. His work was a favorite of the Queen and her family. To learn more about this famous painter and see more examples of his work, please visit our biography of Charles Burton Barber. Families can invite this charming pair into their homes and hearts through the magic of canvas prints. We found one of the Amazon vendors offering American made prints in a variety of sizes. The 12 x 12-inch print is shown here. But, they also have larger sizes – 16 x 16, 24 x 24 and 36 x 36.